"This is one of my dad's favorite recipes that he's handed down to my sisters and myself. It's a little different from traditional guacamole dip cause of the cottage cheese, but very delicious! Serve with chips or vegetables." 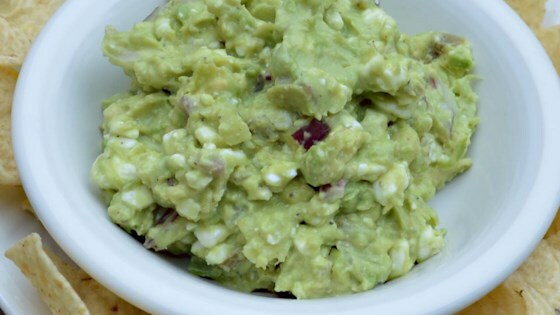 Scoop flesh out of the avocado and place it in a medium size mixing bowl. Mash the avocado well. Add lemon juice to the avocado and mix well. Place tomatoes, jalapeno pepper, onion, cottage cheese, garlic powder, salt and pepper into the mixing bowl; stir until the ingredient are combined. Chill for at least one hour before serving. I recommend to puree the cottage cheese before adding to mixture to create a smoother consistency. Great dip recipe and a healthy addition with the cottage cheese. It seems to need a bit more pizzaz, maybe some hot sauce or more peppers, but it's good. The best recipe I have found on this site to date!!!! !